A number of successful poker players have managed to amass huge bankrolls without depositing any money by playing freeroll poker tournaments. Rather than depositing money at poker rooms, many established poker players have used freeroll tournaments as a means of creating bankrolls from nothing. Female professional poker player Annette Obrestad – winner of the first annual World Series of Poker Europe (WSOPE 2007) – built up her massive bankroll starting from absolutely nothing – just by playing free internet poker. Playing under the alias “Annette_15,” Annette Obrestad has a large collection of free internet tournament wins. She’s also famous for winning a $4 180-seat Sng. Although sounding nothing special in itself; it was the manner she won which made her so popular. Annette Obrestad never looked at her hole cards during her entire freeroll tournament, except for one occasion when she was faced with an all in. The secret to her success, and one which can be followed by any student poker player, was to base her strategy entirely on her position and reading skills. 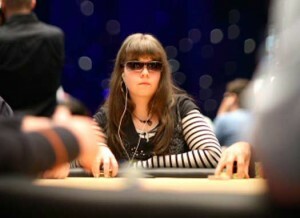 By studying her opponent’s moves and using her internet poker strategy, Annette “Annette_15” Obrestad managed to finish SNG in 1st place playing blind. (“Rounders” fans will remember Matt Damon’s famous lines when he notes how he could beat any of the judges at the poker table and sweep up the cash without ever looking at his cards). What Annete Obrestad’s online SNG proved however, was that with the right internet poker strategy and intelligence (she was only 18 years old at the time), anyone can win freeroll tournaments and build a bankroll. Famously, internet poker sensation Tom “Durrrr” Dwan also built up his internet poker career starting on just $50. He’s famous for how he never went bankrupt and made his giant multi-million dollar bankroll from that original $50. Though not quite starting from scratch like Annete Obrestad, Durrrr’s successful internet poker career and bankroll management system still makes for compelling reading. Like many others, he started his internet poker career from next to nothing, but from sound strategy, patience and a steep learning curve, he has moved up from freeroll tournaments to $5000/$10,000 stakes. Try the Freerolls at Titan Poker by Downloading Below. Titan Poker offer $100 freerolls everyday for new players who’ve signed up in the last 90 days. Free to Enter! When you’re looking for a freeroll tournament, ideally you should look out for two things: a low number of entrants and a decent prizepool. The fact is many freerolls offered by poker rooms are a waste of time because they are simply not worth the hassle. Entering a $50 freeroll with 500 registered players gives you such bad odds. When choosing a freeroll tournament you want to find something with small competition relative to the prizepool. A $50 freeroll with less than 100 players gives you alright odds for example, as does a $500 freeroll with less than 1,000 players. Freeroll tournament strategy is different to regular tournaments. Players arn’t risking anything to enter, which means they have nothing to lose. Because of this these games have tons of maniacs and over agressive players who don’t care how they risk their chips. Now there are generally two ways of playing freerolls successfully in leu of this. Option one is to play tight tournament poker (perhaps your best 10 hands), and conserve your chips, taking advantage of loose weak players and waiting for the maniacs to dry out. Eventually you’ll grind out weak players who leak chips by making bad EV decisions, and if you stay in long enough the freeroll will start to normalise as players are now in a position where they have something to lose. Option two is to join the maniacs. The fact is that many of the maniac players who move all in on the first hand will double/triple up and give themselves a big advantage for the later rounds. Increasing your chipstack early gives you a massive advantage because you’re no longer susceptible to having a small stack that can get called so easily by every other player. If you have a stack of 2,000 and your opponent’s is 14,000 for example, he could easily afford to call your AA with JK – hence your fold equity and bluffing ability would be low (this is bad for building chips in tournaments). Thus your strategy instead of playing tight can also be to play ultra agressive – at least for the early stages. Going all-in on your first hands and doubling up gives you a much healthier stack and puts you on a level playing field with the others who rapidly increased their stacks. Overall freeroll tournament strategy is about realising how your opponents are going to play, and working around that. You can either play tigh and hope not to get unlucky when you move all-in (at some point you will have to do this), or you can make the risks early and try to double/triple up to give yourself a real chance. While not providing anything spectacular in terms of bankrolls, playing online freeroll tournaments provide a fantastic, risk-free way of building something from nothing. As long as you’re willing to grind out at lower stakes tables and have the patience and maturity to play at your bankroll level, you should become a profitable internet poker player and be able to move up the stakes gradually as your bankroll increases.